The protocol was specified before the review was undertaken. The review included randomised or quasi-randomised studies that investigated the effects of any stretching technique, before or after exercising, on delayed onset muscle soreness, risk of injury, or athletic or sporting performance. Studies were included only if stretching was conducted immediately before or after exercising. Studies reported in languages other than English were not included as translations were not available. Relevant studies were identified by searching Medline (1966 to February 2000), Embase (1988 to February 2000), CINAHL (1982 to January 2000), SPORTDiscus (1949 to December 1999) and PEDro (to February 2000). In Medline, a translation of the optimum OVID search strategy of Dickersin et al was combined with specific search terms for each topic shown in the box.9 The Medline search strategy was translated into comparable search strategies for Embase, CINAHL, and SPORTDiscus. PEDro was searched with the terms “stretch,” “exercise,” “warm-up,” and “cool-down” in the abstract field. Bibliographies of studies identified by electronic searches were then searched recursively until no more studies were identified. MG screened search results for potentially eligible studies, and uncertainties about the eligibility of a particular study were resolved by discussion with RDH. Methodological quality was assessed with the PEDro scale, which is based on the Delphilist.10 We used this scale because its items were thought to be important by a panel of experts,10 its reliability is supported empirically,11 and we have extensive experience in the use of this scale (ptwww.cchs.usyd.edu.au/pedro A total score out of 10 is derived for each study from the number of criteria that are satisfied (see footnote in table 2 for a brief description of criteria). The quality of included studies was assessed independently by two assessors, and disagreements were resolved by a third independent assessor. Only studies scoring at least 3 were considered in the initial analysis. All studies investigating effects of stretching on muscle soreness were scored on numerical scales, but the scale metric varied across studies. To facilitate pooling, soreness scores were converted to percentages of the maximum possible score. For ease of interpretation, soreness data are reported as mm on a 100 mm analogue scale. Some studies reported means and standard deviations of scores before and after the test, but not of changes from before to after the test. To calculate standard deviations of change scores, we assumed that the correlation between before and after tests was 0.5.12 Crossover studies reported standard deviations in cells but not standard deviations of paired differences, so the standard deviations of the differences were calculated in the same way. The true value of the correlations is likely to be higher than 0.5, so the variances of estimates derived from these data are likely to be conservative. Raw time to event data from two published studies were obtained directly from the authors. Where more than one study was available on a particular outcome, we assessed homogeneity of subjects, interventions, and outcomes. Results of comparable studies were pooled in meta-analyses. Meta-analysis of continuous outcomes (scores for muscle soreness) was performed with a fixed effects model using the inverse of the estimated sampling variances as weights. 12 13 The time to event data were analysed with Cox regression. 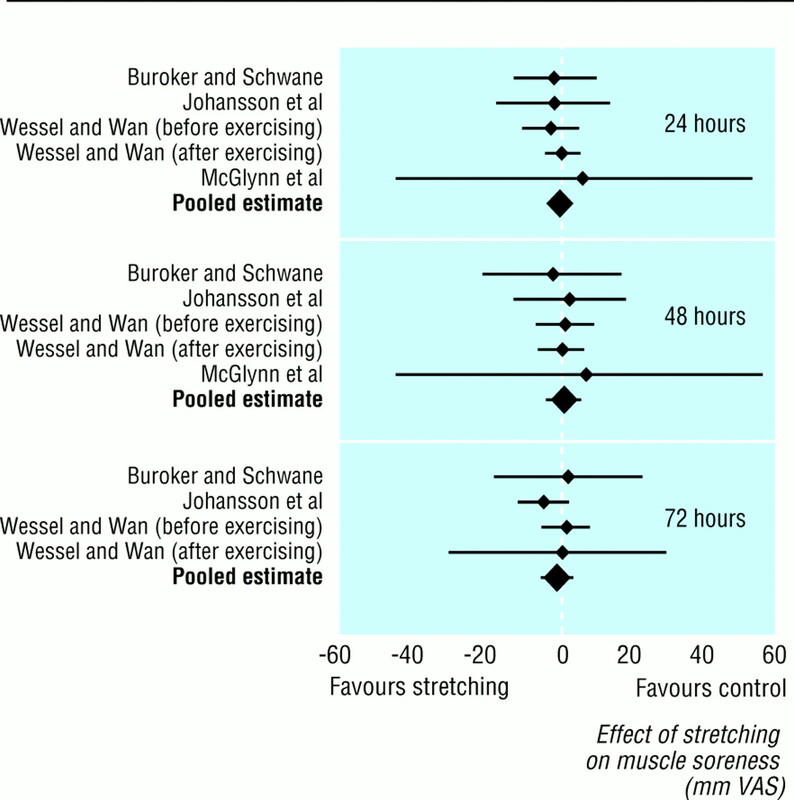 Only one small and inconclusive study investigated effects of stretching on athletic performance, so these are not discussed further in this review.14 Six studies investigated effects of stretching on delayed onset muscle soreness, and two investigated effects of stretching on the risk of injury (table 1). Data from 77 subjects were pooled (27 subjects allocated to stretch groups only, 20 subjects allocated to control groups only, and 30 subjects allocated to both stretch and control conditions). Figure 1 shows the findings of individual studies and pooled estimates. The pooled mean effects of stretching on muscle soreness at 24, 48, and 72 hours after exercising were −0.9 mm (on a 100 mm scale, negative values favour stretching; 95% confidence interval −4.4 mm to 2.6 mm, P=0.70, n=77), 0.3 mm (−4.0 mm to 4.5 mm, P=0.45, n=77), and−1.6 mm (−5.9 mm to 2.6 mm, P=0.77, n=67), respectively. Sensitivity analysis indicated that the choice of threshold quality score and assumptions about correlations between repeated measures had little effect on this result. Two studies evaluated the effects of stretching before exercising on the risk of injury in new military recruits undergoing 12 weeks of initial training. 21 22 The first study investigated effects of supervised stretching of calf muscles before exercising (two stretches of soleus and gastrocnemius muscles for 20 seconds on each limb, total stretch time 160 seconds) on risk of six specific leg injuries (lesions of the Achilles tendon, lateral ankle sprains, stress fractures to the foot and tibia, periostitis, or anterior tibial compartment syndrome). The second study investigated effects of supervised stretching of six muscle groups in the lower limbs before exercising (one 20 second stretch to each muscle group on each limb, total stretch time 240 seconds) on risk of soft tissue injury, bone injury, and all injury. Recruits were considered to have sustained an injury if they were unable to return to full duties without signs or symptoms in three days. In both studies, subjects in both stretch and control groups also performed gentle warm up exercises. The two studies yielded similar estimates of risk reduction (hazard ratios 0.92 (0.52 to 1.61) and 0.95 (0.77 to 1.18); fig 2). Risks of injury in the two studies differ because injury is defined differently. Time to event data (2630 subjects, 65 platoons) were combined; 1284 subjects (32 platoons) were allocated to stretch groups and 1346 (33 platoons) to control groups. The discrepancy in sample size occurred because subjects were quasi randomly allocated to an odd number of platoons by military personnel who did not participate in the studies, and then platoons were randomly allocated to groups by the experimenters. A total of 181 injuries occurred in stretch groups and 200 injuries in control groups. Survival curves for stretch and control groups were similar (fig 2). For the meta-analysis the data were analysed with a Cox regression model that incorporated a study factor (study 122 or 221) and a stretch factor (stretch or control). An interaction term was also included in the model initially but was subsequently omitted because it did not contribute significantly (P=0.88). Additional analyses were undertaken to take account of possible clustering of outcomes by platoon, but the results were essentially identical so are not reported here.23 The pooled estimate of the hazard ratio for the stretch factor was 0.95 (0.78 to 1.16,P=0.61). This systematic review finds clear evidence from five studies of nominally moderate quality that stretching before or after exercising has no effect on delayed onset muscle soreness. Two further studies on army recruits undergoing military training strongly suggest that muscle stretching before exercising does not produce meaningful reductions in the risk of injury. Not enough research has been done to draw conclusions about the effects of stretching on athletic performance. These conclusions are consistent with at least one review of the effects of stretching, but not others.24 – 26 Unlike earlier reviews, we used a systematic review methodology to eliminate potential sources of bias as far as possible, but this does not guarantee the absence of bias. Our review may have been biased by publication bias or by inclusion only of studies reported in English. 27 28 Both factors would be expected to inflate estimates of the effects of treatments, yet we found that stretching has no effect on delayed onset muscle soreness or on risk of injury. When we performed a less sensitive search for studies in languages other than English we found no studies that satisfied the inclusion criteria. The PEDro scale, which we used to discriminate between studies of different quality, has not been fully validated. Use of the PEDro scale is, however, unlikely to have biased our conclusions as study findings were consistent (fig 1). Meta-analysis of almost any combination of the included studies is likely to have produced similar findings. The results of five studies (77 subjects) imply that stretching reduces soreness in the 72 hours after exercising by, on average, less than 2 mm on a 100 mm scale. Most athletes will consider effects of this magnitude too small to make stretching to prevent later muscle soreness worth while. Although these data imply that the muscle stretching protocol used in these studies does not appreciably reduce risk of injury in army recruits undergoing military training, it is not possible to rule out with certainty a clinically worthwhile effect of other stretch protocols on risk of injury in other populations. It would be particularly interesting to determine if more prolonged stretching carried out by recreational athletes over many months or years can produce meaningful reductions in risk of injury. We thank Rodney Pope for allowing us to use raw data from his studies and for performing the analysis of clustering. Contributors: RDH and MG designed, analysed, and wrote up the review. MG conducted the search and extracted data with assistance from RDH. Both authors are guarantors for the paper. .Prevention of muscular distress after exercise.Res Q1961; 32:177–185. .Electromyographic observations of the effects of static stretching upon muscular distress.Res Q1961; 32:468–479. .Flexibility and its effects on sports injury and performance.Sports Med1997; 24:289–299. .Effects of a static stretching program on the incidence of lower extremity musculotendinous strains.J Athletic Training1999; 34:11–14. .Increasing hamstring flexibility decreases lower extremity overuse injuries in military basic trainees.Am J Sport Med1999; 27:173–176. .The influence of flexibility on the economy of walking and jogging.J Orthop Res1990; 8:814–823. .Effects of contract-relax stretching training on muscle performance in athletes.Eur J Appl Physiol1997; 76:400–408. , eds. Systematic reviews.London:BMJ Publishing,1995. .Identifying relevant studies for systematic reviews.BMJ1994; 309:1286–1291. .The Delphi list: a criteria list for quality assessment of randomized clinical trials for conducting systematic reviews developed by Delphi consensus.J Clin Epidemiol1998; 51:1235–1241. .Reliability of a scale for measuring the methodological quality of clinical trials. In: Proceedings of the Cochrane colloquium.Rome, Italy:Cochrane Centre,1999:39. .Undertaking systematic reviews of research on effectiveness—CRD guidelines for those carrying out or commissioning reviews.York:University of York,1996. .Some statistical methods for combining experimental results.Int J Technol Assess Health Care1990; 6:5–30. .Stretch shorten cycle performance enhancement through flexibility training.Med Sci Sports Exerc1992; 24:116–123. .Does postexercise static stretching alleviate delayed muscle soreness?Physician Sportsmed1989; 17:65–83. .The effects of pre-exercise stretching on muscular soreness, tenderness and force loss following heavy eccentric exercise.Scand J Med Sci Sports1999; 9:219–225. .Effect of electromyographic feedback and static stretching on artificially induced muscle soreness.Am J Phys Med1979; 58:139–148. .The effects of static stretching and warm-up on prevention of delayed-onset muscle soreness.Res Q1989; 60:357–361. .Effect of stretching on the intensity of delayed-onset muscle soreness.Clin J Sports Med1994; 4:83–87. .Various treatment techniques on signs and symptoms of delayed onset muscle soreness.J Athletic Training1996; 31:145–152. .A randomized trial of pre-exercise stretching for prevention of lower-limb injury.Med Sci Sport Ex2000; 32:271–277. .Effects of ankle dorsiflexion range and pre-exercise calf muscle stretching on injury risk in army recruits.Australian J Physiother1998; 44:165–177. .Analysis of data arising from a stratified design with the cluster as unit of randomization.Stat Med1987; 6:43–52. .Stretching before exercise does not reduce the risk of local muscle injury: a critical review of the clinical and basic science literature.Clin J Sports Med1999; 9:221–227. .The warm-up procedure: to stretch or not to stretch. A brief review.J Orthop Sports Phys Ther1994; 19:12–17. .Warm-up and muscular injury prevention. An update.Sports Med1989; 8:239–249. .Publication bias in meta-analysis: its causes and consequences.J Clin Epidemiol2000; 53:207–216. .Selecting the language of the publications included in a meta-analysis: is there a Tower of Babel bias?J Clin Epidemiol1995; 48:159–163. .An evidence based approach to individualising treatment.BMJ1995; 311:1356–1359. .Critical appraisal of clinical trials. II: Estimating the magnitude of treatment effects when outcomes are measured on a dichotomous scale.Australian J Physiother2000; 46:309–313.